Say Congratulations on their new baby boy with this gift basket! 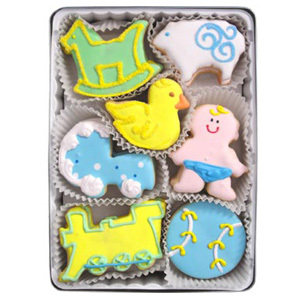 These organic gourmet cookies include blue baby carriages, yellow ducks, baseballs, trains, green rocking horses, and white lambs and babies! Perfect baby gifts. As seen on the Food Network!